7:42am - Well, all in all, "The Great Tent Camping Expedition" turned out be, a disaster of Big Tent proportions! That is the reason, just after sunrise this morning, all campers piled into Little Honda and returned to A53 at Lone Wolf. "Home Is Where The Heart Is" over and over and over again! Team Members, Little Boid, Little Honda and Little iPhone got together to try and find out why this thing occurred. The trio volunteered to prepare an Exposé Report to be presented to all the Team Members, later this morning. A summation of this Exposé Report was conveniently mis-laid on the desk in George's office. So we may now reveal to you, Dear Reader, what it said! "Everything concerning "Big Tent", was completely untested. All the stuff stored in Big Tent at our camping site, was just tossed in. The three of us are in agreement that there should have been a Big Tent shake-down before The Team took off on the actual expedition. This shake-down could have been conducted at our A53 space at Lone Wolf. At that location, those conducting the shake-down testing could have easily returned to the comfort of Miss Twayler when things went south. "The Great Big Tent Camping Disaster"
"Does this mean that we will not go camping anymore?" 3pm - So... are going camping again.....or what? Yes, as far as I am concerned [I = Tioga George]. Here's the thing. Yesterdays tent camping experience highlighted a couple of BIG things for me. Things that I already knew about. But perhaps I did not want to accept. I should not be walking at nite. Bad balance! I should never test myself physically anymore. My times for that testing are long gone! That brings me to a very light trailer. Whatta yah think? Hmmmm? The teardrop looks like the perfect solution. I'm 81 and know I could no longer handle tent camping and you're only 2 years younger. That's why I still have my '83 Winnie. It may be old, but it has the conveniences! If MsTioga had not been destroyed, I'd be like you. Still RVing along! But then, if MsTioga did not get destroyed, my heart problems may have only been found during my autopsy! I guess that camping in a tent takes more preparation and planning then jumping in an RV and going. Especially when you are used to living in the RV and just have to turn on engine and unplug to go somewhere else. Good for you for going and hopefully you'll get all the bugs worked out and have a great time next time. I believe that you are correct. My tent camping experience had everything go wrong. Everything! Probably that badf would not happen like that again. However, maybe I was lucky that everything did go wrong. Now I am looking for a terrific camping experience. Which I might NOT have done. A teardrop might do it for me. Our first trip in the smaller Class C was a disaster after being used to the 40' Alfa. Couldn't find things, didn't remember where to put things, forgot things etc etc. But now after 3 short trips I hope we have it together. Hee hee Well, George, welcome to real camping again! This is why it's a pass time for the younger generation. One thing good about it is that you certainly appreciate the little conveniences such a soft bed, bathroom, and kitchen. I agree with your comment. My BIG discomfort in that tent camping experience, was NOT being able to sleep well. And of course, lots of stuff not working. Disappearing. Etc. A TearDrop might resolve all of that. We have a 17ft R-pod trailer. It is easy to hitch to our truck and tows like a dream. Because it is small we can see the cars behind it while driving. Makes camping simple and fun. My Honda may not be able to tow a 17 ft R-Pod. That would mean buying a larger tow vehicle. That's why I am considering a very light TearDrop. I like tent camping and I'm 72 years old. I have a pop up tent...lay it flat then walk in through the door to pop up the tent...a knob you push up and clicks in...no poles to fiddle with. I use a long thin blade to set up my camp cot or I can use my self inflatable mat...inflates up to a point then blow a few puffs into the mat and it's done. All camping gear came from REI...they help you match camping year to you based on your physical stamina. I just finished a tent camping trip to Nevada, Utah and back to AZ...my home. George good idea to practice before hand...I did with my equipment and to make sure I had everything needed to set up camp. Good luck on your next try...hopefully soon. It could have been, that if I had setup my camp as you described in your comment, I would not have given up on tent camping? But.....maybe giving up on tent camping for me was inevitable and a darn good idea too. In time I might be blogging about my future camping style. I'm doing a lot of thinking about how? If you could find a small, light trailer that is towable with your Fit, I would go for it. If it's affordable, the advantage mainly is no packing it up except for food and a battery. As for this first fiasco, live and learn, right? Trialers are hard to tow. Once in a campspot very diificult to back out. Ive pulled into parking lots and could not get out. Had to unhitch the trailer and hand turn it to then hookup again. Made everyone very pissed at me scewing up traffic flow for an hour. I used to tow a T@B with a Subaru. Worked ok in the flat Midwest, but as soon as I hit any hills (like the Western US) it was very underpowered even though the T@B was 1500 lbs less than the Subaru's max. towing capacity. I'd seriously worry about trying to tow anything with a Fit. 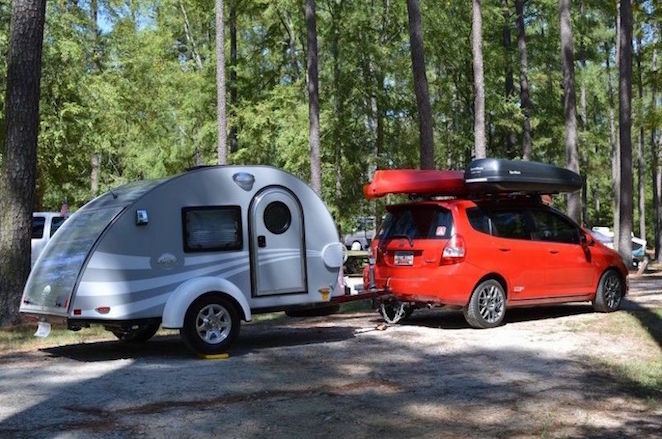 Before you consider spending many more thousands on a 2nd trailer-- what about trading the Fit for a slightly larger vehicle that you could sleep in comfortably? The Good Luck Duck blogger (Roxi) has done quite a lot of camping in a Toyota Prius with a tent that fits over the open rear hatch. The cool thing about a Prius is that it can run the AC and Heater automatically from the Hybrid battery, and when the battery juice gets low, the engine automatically starts to recharge it. How cool is that? Another blogger friend traveled full time for a while in a Honda Odyssey minivan. With the rear seats removed, it was long enough for her cot, and to hold her clothes, food, water, etc. Hope these ideas give you some food for thought. Small trailers are lots of fun for weekend campouts, but towing can be a PITA at times (and sometimes pretty strenuous to hitch/unhitch and level the trailer). Maybe a vehicle that could serve as both your economical daily driver as well as a comfortable place to sleep when you wish to might be easier to manage? Have you thought about a van? You can stealth camp like in the old days. Do you really drive so much that you need a small compact vehicle? You'll have room for all your stuff. George, you might want to try tent camping one more time for a short duration before you abandon all plans to tent camp again. Certainly you have learned from your initial experience and perhaps another attempt will be a positive experience. 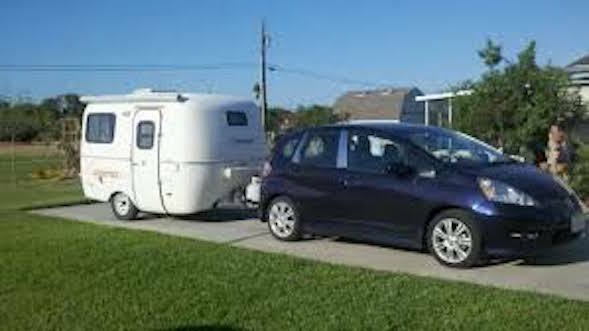 It is a major decision financially and otherwise to get into purchasing a small compact trailer and modifying your vehicle as a tow vehicle or purchasing another tow vehicle. When you factor in your age and your medical status, you might want to re-think this avenue. I drive a Dodge Dakota Sport manual transmission. It's not a huge truck but it's big enough for me. It holds all my equipment & I can carry three to four passengers at the same time. The rear seats are not jump seats but full size seats. I have thought about getting a truck tent but have not done so instead I carry the pop up tent. I have plenty of room in the truck bed for lots of other stuff. The Dakota is mid size truck not too small and not too large...just right. I've had my truck since 2001 and I love it. PS a woman on a motorcycle towing a tear drop watched me set up camp in Ely, NV. She said I've never seen a camp go up that fast...I've seen people struggle for five hours trying to figure their tent LOL. My pop up tent requires pushing and pulling a knob to set up and deflat...easy peasy.